A contract of employment is a contract between an employer and employee in which the terms and conditions of employment are stated. The term “employee” denotes anyone who is employed under a contract of employment for remuneration and an employer is such person who employs an employee. 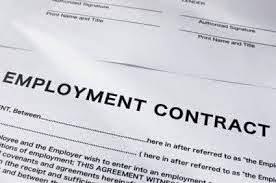 An employment contract is an agreement which carries with it an obligation to pay wages in return for service and a corresponding right of control on the part of the employer. Before an employer/employee can make claims under the contract of employment, such party must prove that the existence of a contractual relationship. A contract of employment can be oral, written, or partly oral and written; it may even be inferred or implied from the conduct of the parties, though most contracts of employment are either oral or written. Name, address of the employee and the place and date of his engagement. Any terms or conditions relating to: hours of work; holidays and holiday pay; and Incapacity for work due to sickness or injury, including any provisions for sick pay. It should be noted that contract sof employment are not binding on the family or dependants of the worker unless it contains a provision to that effect. Also persons under the age of 16 re not capable of entering contracts of employment except such contracts are for apprenticeship. Also, no contract of employment can bar a worker from belonging to a trade union. Where it’s a contract of 3 months or less, one day notice should be given. One week notice if more than 3 months but less than 2 years; two weeks notice where the contract has lasted for more than 2 years but less than 5 years and one month, where the contract had continued for 5 years or more. Usually most contracts of employment provide either one month or 3 months notice or one month or 3 months’ salary in lieu of notice.